Space Studios Manchester features a range of rooms available to hire for both productions based onsite and third party bookings. 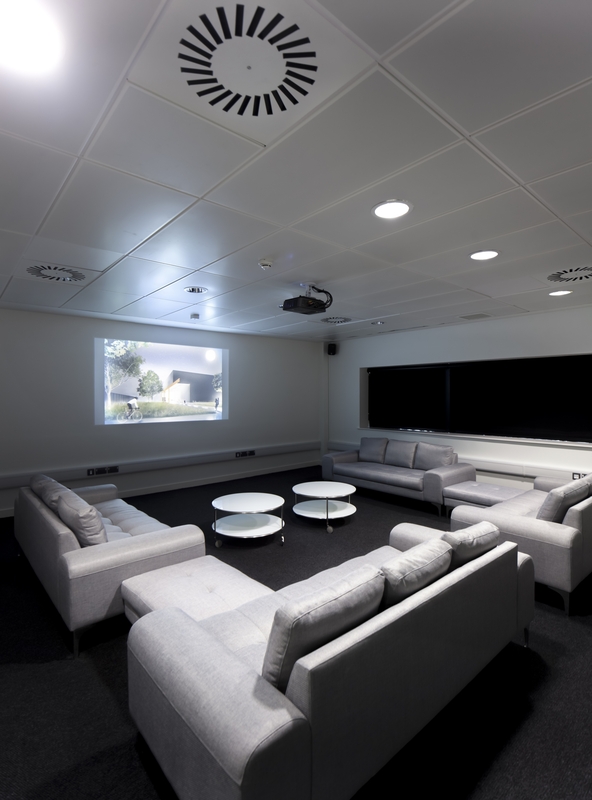 Adjacent to The Boardroom is The Screening Room (pictured to the right) which can comfortably accommodate up to 25 people on the seating and sofas. Both spaces feature an adjacent kitchen, coat rail next to door and can be supplied with a full range of catering options. Please note that when making a booking enquiry via the form below, the reservation is not confirmed until you receive an email stating so from Space Studios Manchester. All spaces are subject to availability. The Screening Room at Space features comfortable seating for up to 25 people with an HDMI-connected projector, air conditioning and an adjacent kitchen area. The room can also be used for script readings, castings or production meetings. Catering & refreshments can be provided for all bookings. Please contact us for menu and prices. Onsite car parking for up to 25 people. The Boardroom is located on the first floor of Space Studios Manchester, suitable for more formal meetings. It features a boardroom table with seating for 12 plus a wall mounted plasma screen with HDMI connections. Onsite car parking for up to 12 people. Please note if you would like to book production space please call 0161 205 5508 opt 2 or email enquiries@spacestudiosmanchester.co.uk This booking form is only for meeting room / event use.